These Nunavut teen artists are throwing a special event "down south" as they fundraise for a massive new mural project. Like any suburban mall, you'd expect to find Square One in Mississauga, Ont. teeming with teenagers, but there are four kids hanging by the Holt Renfrew who definitely stand out — not least of all 'cause they're 25-feet tall. 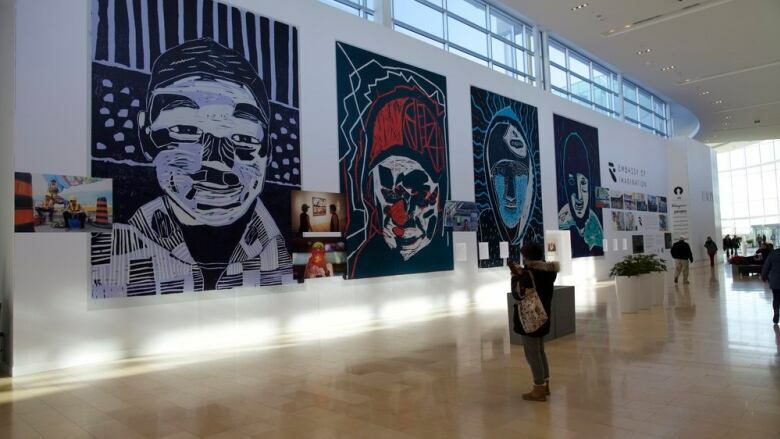 Four enormous self-portraits are currently appearing at the mall's Entrance 3 — the centrepiece of a satellite art exhibition featuring work by 11 young artists from Cape Dorset, Nunavut. 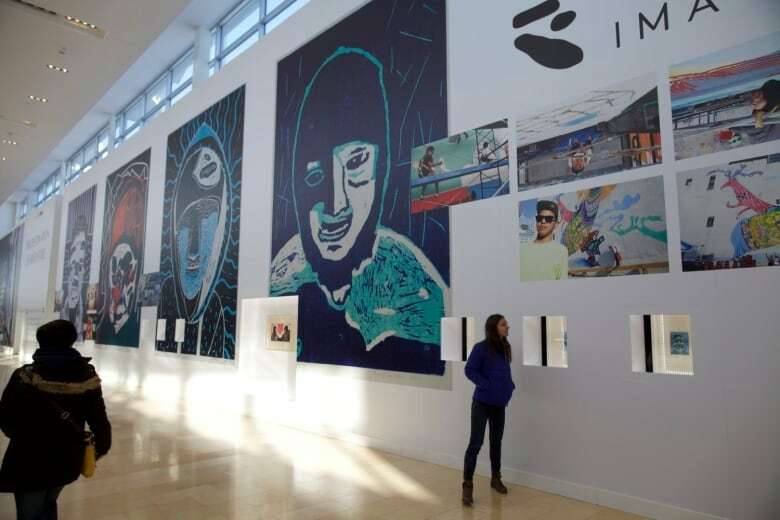 In addition to the larger-than-life pieces, the show features a series of framed linocut prints alongside plans for the teens' next (large-scale) art project: a mural for their hometown's community hall, which they plan to design and execute this summer. 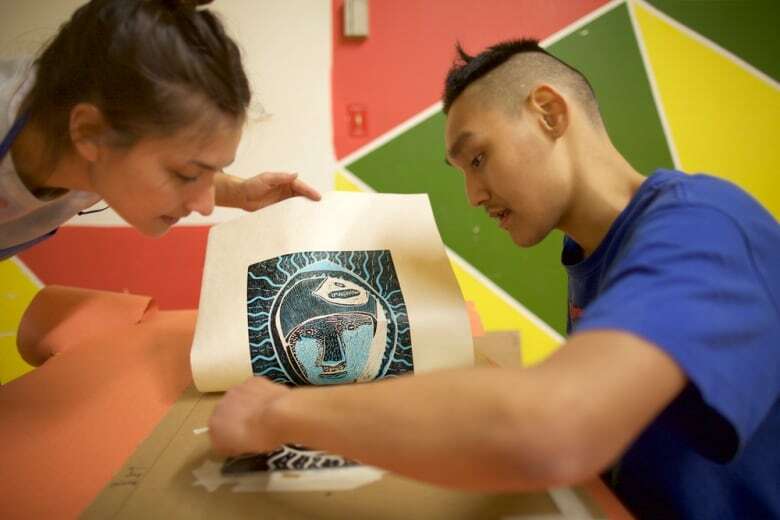 Based in Toronto, the couple first visited Nunavut when they were commissioned to create public murals — and over the last three years, they've returned to Cape Dorset, travelling to this community on the southern tip of Baffin Island, where they lead art workshops with kids between the ages of 14-19. 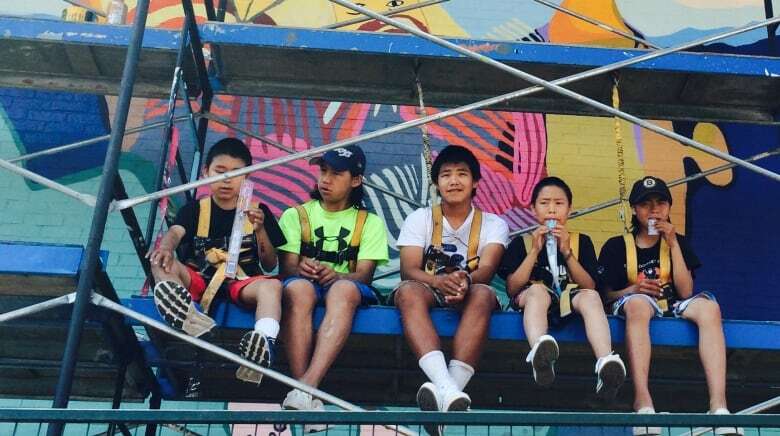 During the Pan Am Games, the teen painters gained national attention for their mural project in Toronto, and last summer, they created another public work in Montreal, a piece inspired by the Inuit perspective on climate change. For their upcoming project in Cape Dorset, the teens plan to paint a mural that will completely envelop Cape Dorset's community hall — one of the hamlet's most essential public buildings, especially since the high school was lost to a fire in fall 2015. Hatanaka says they hope to raise $10,000, and Square One and Oxford Properties will match donations up to that amount. The project will also receive funding from Canadian Heritage, she notes. Oxford Properties, she says, invited the youth to mount the exhibition after a member of the company caught a P.A. System talk about their art programs up north, and on Sunday morning the mall will be hosting two of the young artists whose work is featured. Starting at 10 a.m. artists Tommy Quvianaqtuliaq and Parr Josephee will officially unveil the exhibition, which continues to April. After a short talk, Hatanaka says the artists will be on hand to chat about the work one-on-one with visitors. "The aim of the event is just to spread the word and show the artwork," she says. The teens are currently studying in Ontario, she explains. 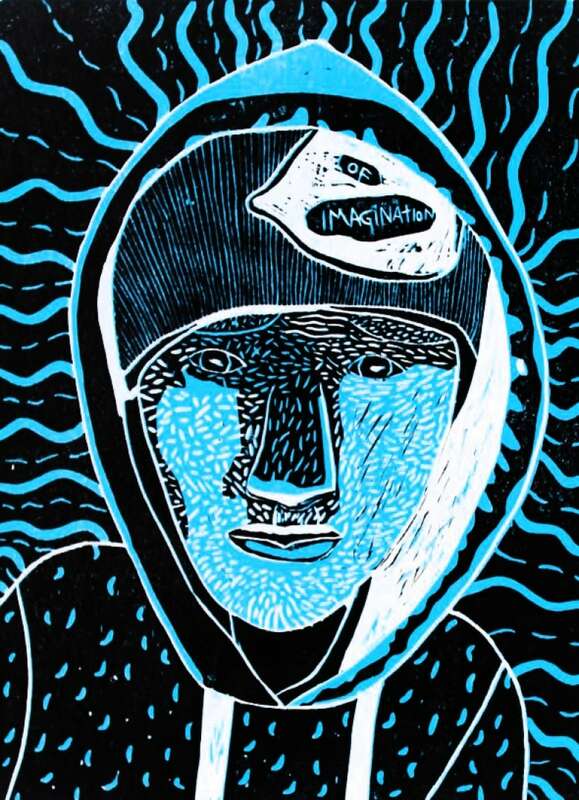 Josephee is attending an arts high school; Quvianaqtuliaq is doing a semester on exchange. But both artists, along with the other teens involved in the exhibition — Joanasie Tunnillie, Latch Akesuk, Cie Taqiasuk, Holly Josephee, Josie Saila, Susie Saila, Saaki Nuna, Kevin Allooloo, Salo Ivaluajuk, Ezeevalu Samayualie, Salomonie Ashoona, Johnny Samayualie and Aoudi Qinnayuaq — are expected to collaborate on the Cape Dorset mural project come August. If they weren't already in the GTA, a trip to an art opening would be an overwhelming expense, Hatanaka says. Round-trip airfare per person can cost thousands. That said, through the Embassy of Imagination, the teens have continuously mounted projects in communities "down south." This year alone, they'll paint two new murals — one in Ottawa's Byward Market in early July and another in Toronto in the fall. "There's such a hunger for mural painting," says Hatanaka, talking about cities' interest in public art. The artist speaks from experience: her own work appears on walls around the world. Giving the teens a chance to paint in Toronto, Montreal and beyond — while learning on the job — is a hugely empowering experience, she says. "That know-how — it's really a viable part of an art career that they can have," she says, "so we really want to enable them to do that." And the projects, she says, don't just educate the kids. "There is a very big disconnect, just in terms of the fundamental understanding of this massive part of country," she laughs, remembering a conversation she recently had with a Square One visitor who asked why the kids weren't "driving down" from Cape Dorset. (Answer: it's a fly-in community). "I think art is a great way to reach out to people — to engage them in a discussion and exchange." 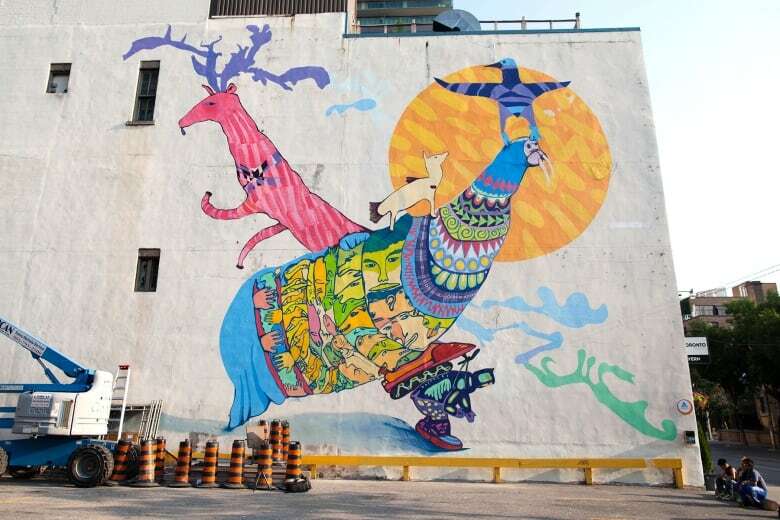 The Embassy of Imagination is collecting donations for their upcoming Cape Dorset mural project through their website. Learn more here.